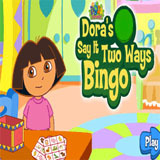 Play Bingo with cute little Dora by matching the pictures she shows to you with the ones you have on your card. Pay attention at the picture in Dora's hand, then look on your card to find the same picture there. If you don't have it on your card, click on the box to make Dora take another picture.